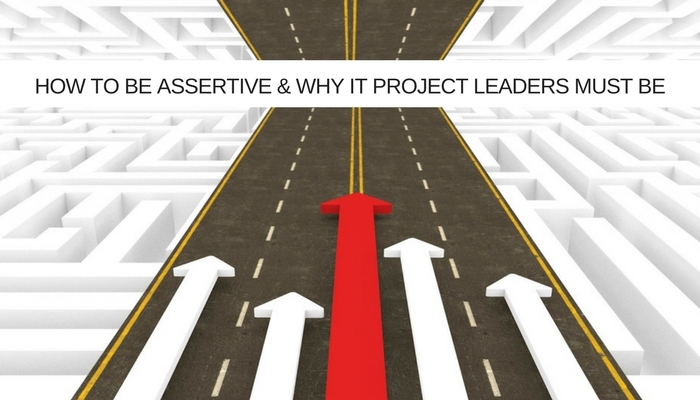 How to be assertive and why Project Leaders need to be. “Beware of Jim, he’s a bit of an ogre!” I was once warned about a project leader at a new firm I had joined. Jim wasn’t the chap’s real name, by the way, and “ogre” wasn’t quite the word that was used. Anyway, it turned out that “Jim” wasn’t really an “ogre”. He was just really assertive. The thing with assertiveness is, like with most things, there’s a good and a bad way to go about it. I recall an IT Project Leader launching a stapler across an office once when things weren’t going right. Everyone from team members to stakeholders were scared of him. He’d have ended up in front of the HR Director these days but, back then, it was just accepted that this was how this guy was. He got results, wasn’t afraid to say no to a scope change request and you didn’t make a mistake … because you were terrified of the consequences. But that’s not assertive. That’s aggressive! Workplace cultures, on the whole, are more friendly now and the days of shouty leaders barking orders and thumping desks are a thing of the past – and that’s a good thing. However, over the last ten years, or so, I have progressively seen assertiveness being bred out of a lot of IT Project Management talent and that’s not so good. In many IT teams, managers have been promoted through the ranks. That means they now lead their friends and being assertive with someone you used to sit alongside can be hard. We have provided end to end project management resources for many teams over the years that lack assertiveness for this very reason. External talent doesn’t come with any emotional baggage. Ultimately though, if this is causing you a problem you are best to address it. You’re there to make decisions, not friends, and some of those decisions need you to be assertive. I wonder, as well, whether workplace cultures have evolved to a point where the lines between managers and those under them are blurred. Open plan offices mean that many bosses and their staff work together without walls. I tell you, getting called into your manager’s office back in the day was more of a big deal than being asked to scoot over to the gaffer’s desk at the end of the bay! Set against this backdrop it’s perhaps easy to see why assertiveness is on the wain. I do believe that it’s an important skill to have in your success toolbox, so, can you be assertive without everyone you work with whispering about what a big “ogre” YOU are? Of course, you can. I’ll come onto how, but first let’s consider why assertiveness matters. 1 – Sometimes The Project Needs A Gentle Shake! The trouble is, as business cultures have become less hostile, many project teams have lost the knack of how to say ‘no’, how to speak up and how to rock the boat when necessary. In her book “Extreme You”, Sarah Robb-O’Hagan identifies many ways to practice assertiveness without being seen as an ogre. One of them is simply learning to speak up. Have you ever been in a meeting where you get frustrated that no-one is bringing up the big problem, the glaringly obvious issue? Sarah explains that this could be your cue to speak up. Surely, if no-one else has noticed the problem, or worse is afraid to speak up, it’s your responsibility to flag it. If you agree, well done, you just became a bit more assertive. Who hasn’t seen a Project slip because no-one was willing to put their head above the parapet? He’s right. I’ve seen talented Project Managers passed over for promotion because they are not seen as leader potential due to their lack of input at meetings. Kaufman also claims that less assertive team members earn less, citing research from Harvard’s Teresa Amabile who published a study called “Brilliant But Cruel” which suggests that if someone is too nice, it is assumed that they’re less competent and therefore less well remunerated. Are you a Leader? Then you have been given the right to lead by whoever pays your wages! In fact, it’s more than a right, you have a responsibility to your stakeholders. But it’s not just leaders that have the right and responsibility to be assertive, it’s everyone who clocks into work on an IT Project. Imagine something goes wrong and you noticed it but said nothing. Surely that’s worse than being known as the colleague who always has a different view, or always flags up a potential mistake, error or flaw. If you spotted thick plumes of smoke billowing out of the kitchen at your workplace, you’d run to the nearest break glass alarm point and sound the bell. You’d cause everyone to down tools, stop work and evacuate to a safe place. It might be nothing, a colleague burning toast, but you’d instinctively feel a responsibility to others in the building. That would be a pretty assertive action and you’d do it in a heartbeat. So, you have it in you. You just need to give yourself permission to use it when you think you see metaphorical thick plumes of smoke billowing out of your IT Project! She’s nailed it. Have you noticed that assertive people tend to be less stressed? It’s not because they get their own way the whole time. It’s because, on the whole, they seek solutions that work best for everyone. They have their say, they put the case for an alternative strategy or they point out the flaw and if their suggestion isn’t the one chosen, at least they know they’ve been heard and can progress with equanimity. Similarly, assertive leaders seek alternative views before deciding. Maybe that’s the key to assertiveness. Engagement. If your whole team feels they’ve had their say and buys into the reason why you’re being assertive, half your job is done for you. Previous Are the greatest IT Change Managers now facing the greatest change?